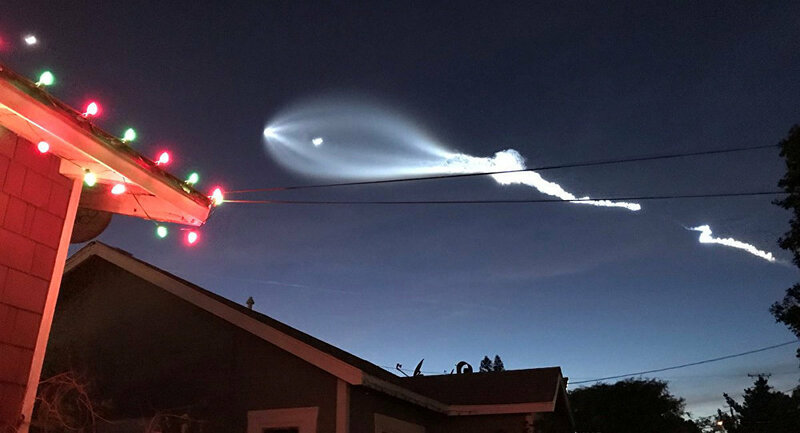 A SpaceX Falcon 9 rocket launched from Vandenberg Air Force Base produced an eerie visage in the night sky over California, leaving those unaware of the launch wondering about what it was. The mysterious bright lights in the sky initially caused quite a fright among the unsuspecting spectators, but soon it became apparent that no space aliens were involved (or harmed). The Twitter audience was left largely amused by this development. — Ricky Dilaurentis® (@R_Dilaurentis) 23 декабря 2017 г. — Jessica Costa (@jsauruslove) 23 декабря 2017 г.
Californians: ALIENS! AAAAHHHHH! RUN! TAKE ME WITH YOU! — Nathan Platt (@nathanplatt) 23 декабря 2017 г. Some also remarked how that nocturnal sight resembled anything but a space launch, recounting earlier speculations about its origins. — Rogelio Delgado (@Rogelio20176735) 23 декабря 2017 г. — Gil (@Gil64_) 23 декабря 2017 г. — Ninja Alex 忍者420 (@NinjaAlex420) 23 декабря 2017 г.